Five Feet Apart Trailer #2: Can Love Survive a Little Distance? 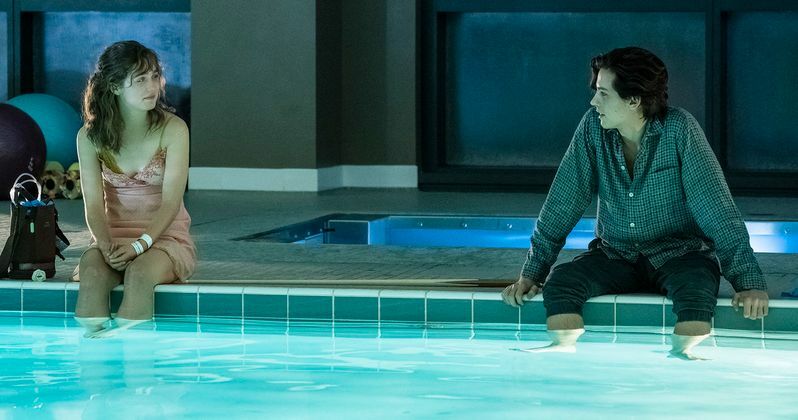 A new trailer for Five Feet Apart is here to give you the feels. The movie is based on Rachel Lippincott's novel of the same name and is clearly aimed at the young adult crowd, perhaps going for the same group that showed up to see The Fault in Our Stars a handful of years ago. Similarly, this movie plays on the idea of tragically sick, young people falling in love, but with a heart-wrenching twist. The trailer starts out with two young people striking up a romance. The key difference being that they're both very sick and can't come within more than a handful of feet of one another, or they could die. The footage is setting up a very emotional and frustrating journey for these two, who have a deep understanding of what they're both going through. Maddeningly, it's exactly because of this shared experience, for practical reasons, they can't be together. If nothing else, this looks like it's going to be an early 2019 tearjerker. In Five Feet Apart, Stella Grant (Haley Lu Richardson) is a mostly normal seventeen-year-old, attached to her laptop and her friends. But unlike most people her age, she's got cystic fibrosis and has to spend a ton of time in the hospital. Her boundary-filled, controlled life is tested when she meets Will Newman (Cole Sprouse), a fellow patient who also has CF. Despite their instant connection, they must keep a safe distance between them because of their condition. Things intensify and temptation rises to throw caution to the wind and embrace their attraction. Richardson recently spoke about the movie in an interview with Cosmopolitan, explaining the message they hope to get across in the movie. "I just watched the movie recently for the first time and I feel like you can see the fun we were having in the movie. Bringing joy and life to these characters, it just goes to show that these kids and people who have cystic fibrosis, they live their life anyway. One of my favorite lines in the movie is when my character says, 'My whole life I've been living for my treatments instead of doing my treatments so that I could live.' That affected me so much and I hope that it gets to people; it can be a very broad things, the message of even if you have something that's holding you back and you have to do something, keep going and fight. You're fighting it to live. You don't have to hand over your whole soul to that thing, to that monster." Justin Baldoni directs from a script by Mikki Daughtry and Tobias Iaconis. The cast also includes Moises Arias, Kimberly Hebert Gregory, Parminder Nagra, Claire Forlani, Emily Baldoni, Elena Satine, Gary Weeks and Sophia Bernard. Five Feet Apart is set to hit theaters on March 15. Be sure to check out the new trailer from the CBS Films YouTube channel below.